If you’re thinking about adding high-end granite countertops to your Dublin home, we are your go-to company for this request. When you’re thinking about renovating your home, you’re probably looking at ways to upgrade the kitchen and bathrooms. These areas are where most people spend the majority of their waking hours, and updates to these rooms offer the highest returns on investment. When you upgrade a kitchen, you have a lot of options. You can replace the cabinetry, although this is one of the most expensive ventures you can take. You may also consider updating the appliances, which will improve functionality while adding value. 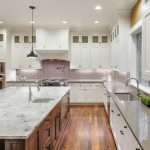 Along with these ideas, another way to improve the look and feel of your home is by adding high-end granite countertops. Granite is a natural stone that is extremely popular for counters in kitchens, bathrooms, and laundry rooms. The word “granite” comes from the Latin word meaning grain, which makes sense as this type of stone has different flecks and grains of color running through it. You can choose from a wide selection of options, showcasing shades of brown, blue, red, green, and black. Since the stone is natural, no two pieces are exactly the same. As a result, you’ll have stunning countertops that no one else already has in their home. High-end granite countertops also come with a variety of benefits. The smooth, polished surface is ideal for rolling out dough or chopping veggies, while the low-maintenance aspect of granite makes it a good choice in the homes of busy professionals who don’t have a lot of time to spend on upkeep. When you choose your slab, the installation process involves cutting the edges to fit the space perfectly. You can choose from rounded or square corners, depending on what fits with your home’s style. Granite slabs can also be cut to fit vanities, large sections of the kitchen, or smaller islands. When you walk into a home with granite countertops, you’ll notice the difference. Even if that’s the only upgrade you make to a kitchen, the stone will make an impression. This option is somehow timeless and modern at the same time, creating a visually appealing space that is also quite functional. Professional chefs love the smooth surface of granite countertops, while budding chefs can create their own masterpieces when they have a good workspace. High-end granite countertops also add a lot of value to a home. If you’re thinking about adding high-end granite countertops to your Dublin, Ohio home, we can help. At The Granite Guy, we carry plenty of options, so you’re not limited to choosing from a handful of slabs. Additionally, our showroom has more than 80 large granite slabs available to view. You can take a closer look at the options and make an informed decision. Something that sets us apart is our attention to detail. When you work with our experienced and knowledgeable team members, you’ll see why we have high reviews and plenty of repeat customers. Contact us at The Granite Guy today to get a free estimate for high-end granite countertops at your Dublin home.